Hey there! This was a quick and spontaneous experiment the other night. We had some apples hanging around that were still good, but just a little bit past their prime. A few minutes later, the kids were digging in and asking for more. I try to take the family apple picking every fall, but I tend to go a little crazy and buy way too many. If you’re like me and you end up with some that have lost that really crisp bite, don’t despair! 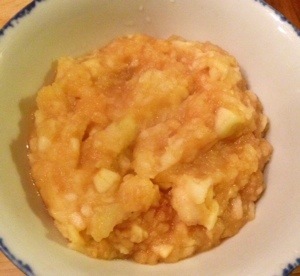 Cook up some applesauce in just a few minutes. I’ve made this twice this week and we’ve had it as a side dish with dinner and also warm over vanilla ice cream (awesome!). I think I’m going to pack some in the kids’ lunches next week, too. Peel and core the apples, then chop into a rough dice. Melt the butter in the saucepan, then add the apples and the water. Cook covered for 3-5 minutes, depending on how ripe your apples were. 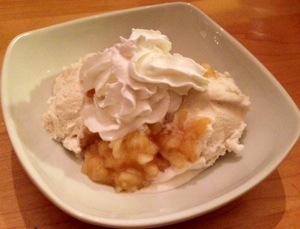 If the apples are soft enough, mash with a fork or the back of a spoon. If not, give them another minute or two. After you mash them up, stir in the sugar and cinnamon. Cook for another couple minutes. Give it a taste and add more sugar or cinnamon if you think it needs it. That’s it! So if you’re at the orchard or farm stand this fall, don’t be afraid to stock up! This entry was posted in Dessert, Dinner, Fruit, Lunch, Side dishes and tagged Apple, Applesauce, Cinnamon, ice cream, paleo, Sugar. Bookmark the permalink.